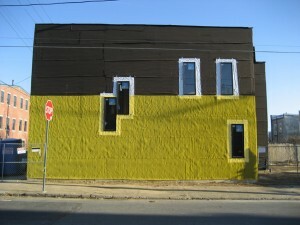 Developer Goes ‘Extra Mile’ With Addition Of Rainscreen System To Home. Chad Ludeman, founder of the development company Postgreen, has achieved his goal of building a new, LEED Platinum home in Philadelphia for only $100,000 by keeping the design basic and the building technologies green. Called the $100K House, which describes the hard construction costs (not including design costs), the demonstration project is located in the East Kensington neighborhood of Philadelphia. The 1,150-sq. ft., two-story, three-room home is Postgreen’s way of showing that green design should be available to the average working family and is meant to be a prototype that will be repeated with variations in other neighborhoods. The idea is to boil the home’s design down to the essential components, while minimizing its carbon footprint. Because of components that include solar panels, radiant heating, and the SIPs sheathing, Postgreen expects annual energy costs to be approximately $1,200. On the decision to use Home Slicker, Ludeman said he was familiar with the product through a professional colleague. Home Slicker is a component of a rainscreen system that alleviates moisture problems in wall assemblies by providing a continuous ventilation and drainage space. Rainscreen systems are recognized by building science experts as the optimum method of wall construction in areas prone to moisture, high temperatures, and humidity. It is applied between the weather-resistive barrier – which can be a synthetic housewrap or felt paper – and the exterior siding and is vented at the top and bottom of the cladding to allow any accumulated water to drain away and air flow to dry the space. Ludeman is forthright about its value to the sustainable design of the 100K House. “It’s simply the best and most robust way to build an exterior wall assembly in this and other climates that receive a decent amount of rain,” he wrote.